When Count Rossi, the head of Martini and sponsor of the Porsche racing team first set sight on the squat and very broad car selected for the 24-hour Le Mans race in 1971, he was horrified. Porsche designer Anatole Lapine had given the body a pink coat, and divided it into individual sections using dotted lines. The designations on these sections sounded like they came from a book for apprentice butchers. The words "snout", "loin" or "ribs" were emblazoned on various body sections, and the car promptly went down in Porsche history as "Pink Pig", "Big Bertha" or "Truffle hunter". The count hastily had all the Martini stickers removed. But the short back model remained pink - and caused a sensation on the track. 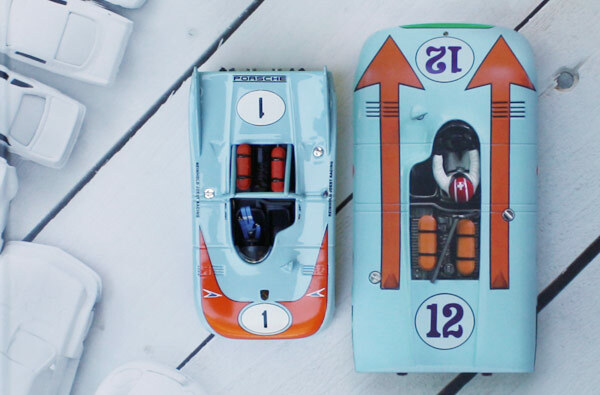 Although it had not been tested at all, the 917/20 won the training session, but in the actual race, lying in fifth place, it had to pull out short of the finish following a crash. 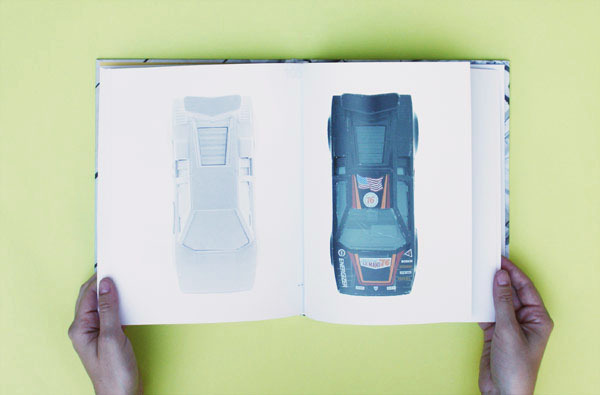 With his book "Go faster" Graphic designer Sven Voelker, who among other things developed the corporate design for the Suzuki brand and began teaching at Burg Giebichenstein in Halle an der Saale this year, has presented a publication that is unusual on several counts. 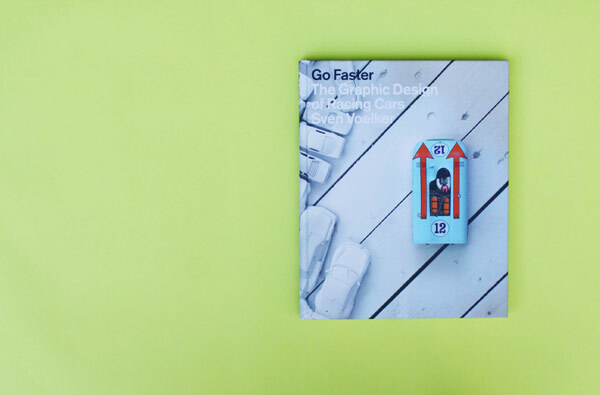 Not only had he noticed that racing cars have always had an attractive graphic design, but also that their appearance is also a major factor in determining how fast they look. 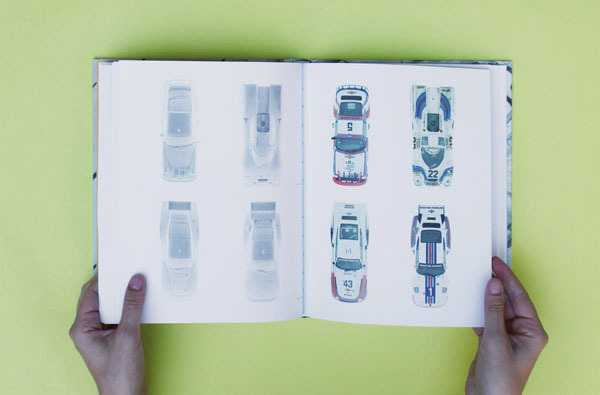 And yet as Voelker remarks in his preface "the history of this creative aspect of automobile motorsport is barely documented . There is little more than a few attractive stories and observations." And the cars themselves. So as to examine the accelerating or electrifying impact of patterns, stripes, arrows and lines, Voelker resorted to two tricks tat were as simple as they qwere effective. 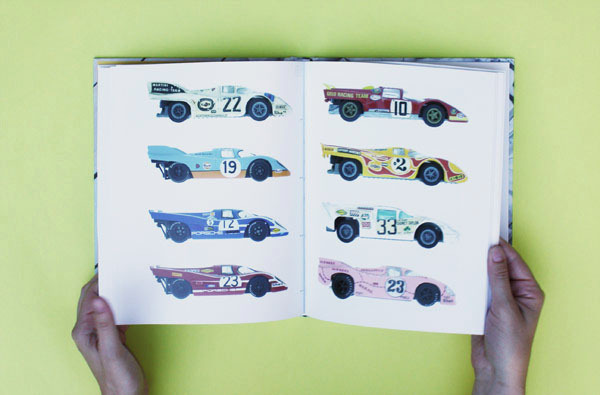 First of all, he not only shows photographs of the racing cars but also examines their graphic quality using a model car collection comprising some 130 cars that had long slumbered in a wooden box in the attic . "Some of them," explains Voelker, "are icons of racing sport but their racing success is not the criterion for the selection of the models. They are chosen solely for their beauty and formal uniqueness ." 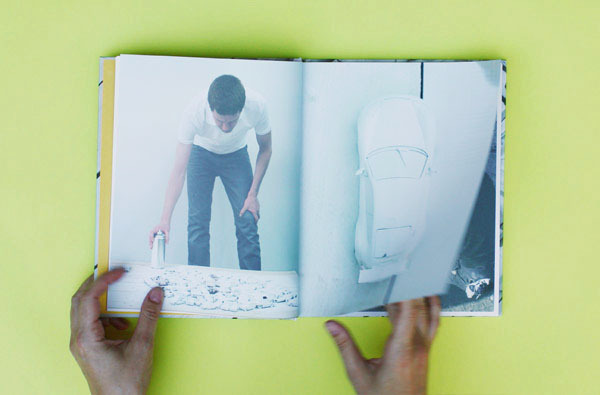 And to emphasize this fact Voelker employed his second trick: he sprayed the miniature racing cars with white loam paint. 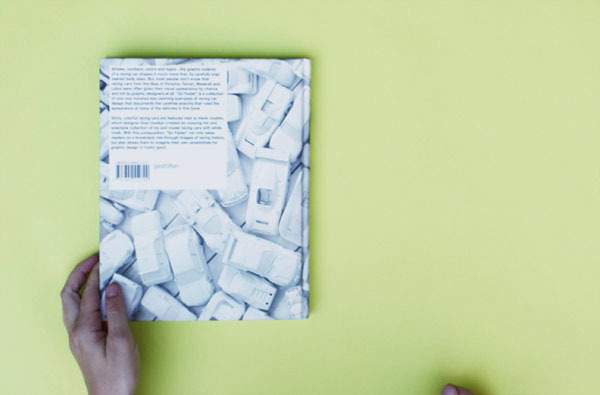 The result was matte white sculptures, which in some cases completely lose the occasionally extravagant raciness of their brightly painted counterparts complete with stickers. 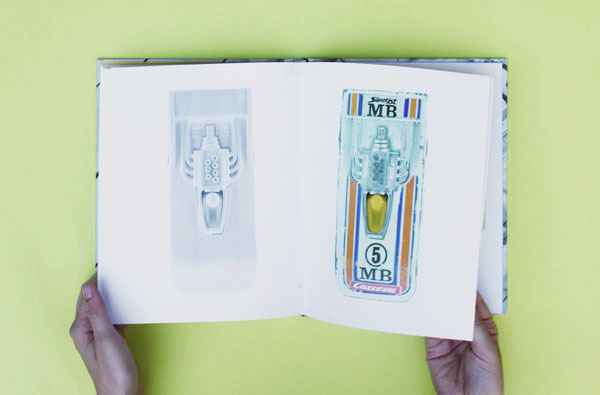 With the help of these two tricks the book shows how three-dimensional racing machines are transformed into icons when they are given a two-dimensional pattern. Moreover, black adhesive tape was sometimes sufficient to emphasize a car body shape developed according to aerodynamic laws, or to lend it a totally different look. 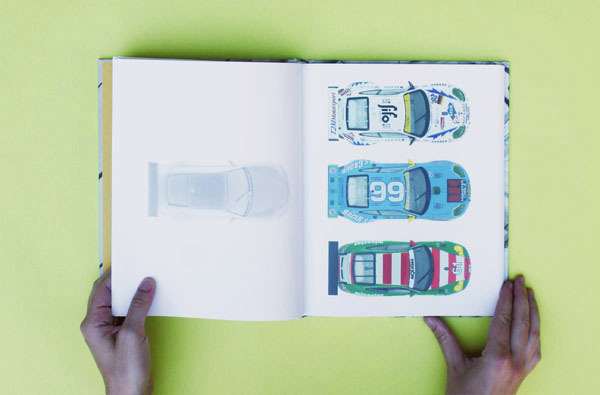 At one time French racing cars were blue, Italian red, German cars white and British models green. When additional nations joined the bandwagon American cars were blue and white, Japanese white with a red sun, Austrian red and white, Belgian yellow and Mexican cars a golden color. It was not until the end of the 1960s that the FIA racing authorities did away with the national colors ruling for racing cars and simultaneously opened up motorsport to sponsors. Now the teams could live out their creativity to the full. Color photos, advertising, television and motorsport magazines also played their part. 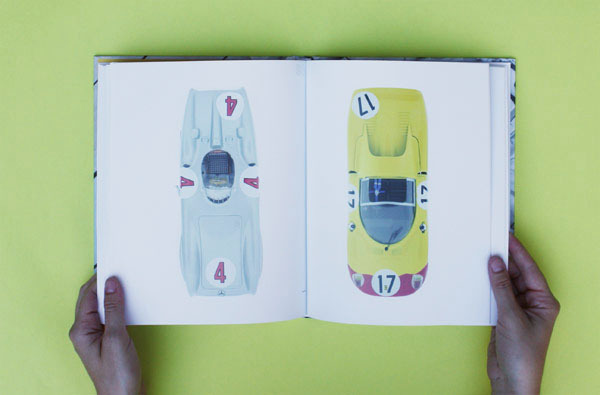 What followed might be called the Pop Art era of racing sport. 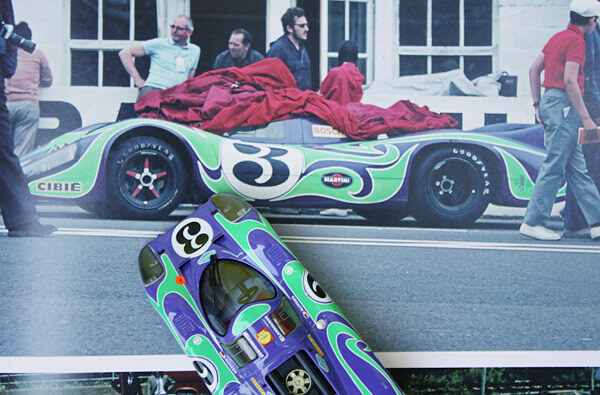 Racing cars, which, thanks to the regulations and aerodynamic laws increasingly resembled each other in design terms were transformed into colorful one-offs. 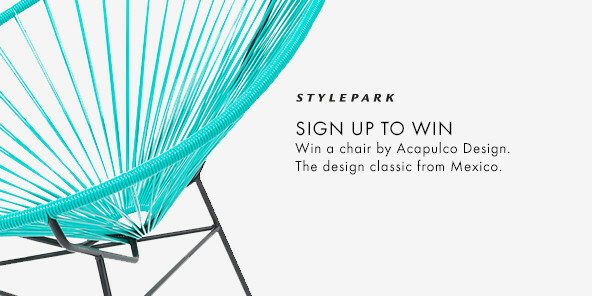 The graphic design made them cool or had a breath of flower power and Woodstock waft across the racing track. Yet with the exception of the BMW Art Cars, still in production today, the racing cars were not initially styled by professionals. Late at night, when the racing engineers had done their work, out came the paint brush and adhesive tape or the compressor machine used to pump up the tires was used as a spraying device. 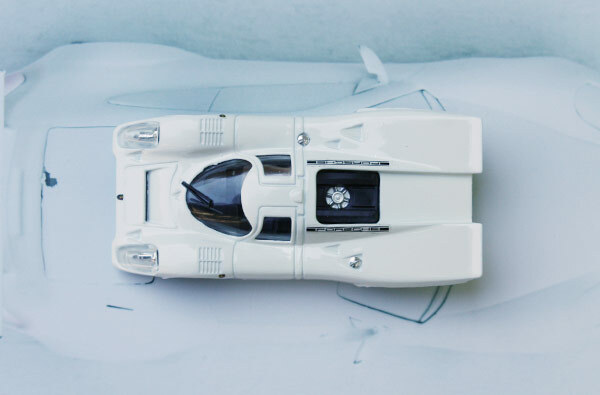 Anatole Lapine, who was Chief Designer at Porsche in the 1970s, came up with a great many unusual designs. 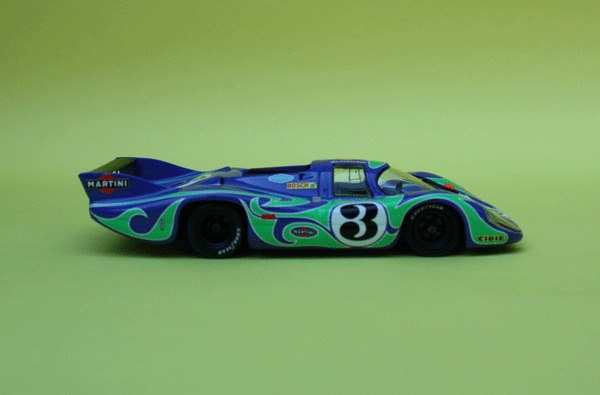 For instance, when it made its first appearance in 1970 in Le Mans, the enormous 917 long-back coupé was styled very much in the zeitgeist and featured the "war paint" of a Hippie car: green shapes wafting over a bright blue background. 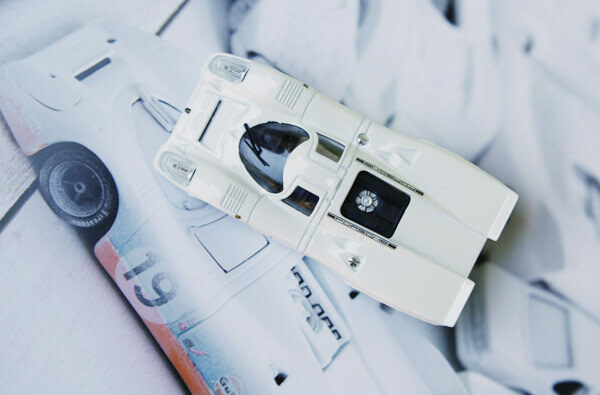 Not only for the brand world championships, which were fought on extremely fast tracks such as Le Mans, Daytona, Sebring and Monza, did Porsche sound the charge with a long back version of the legendary 917, but also with a corresponding appearance. 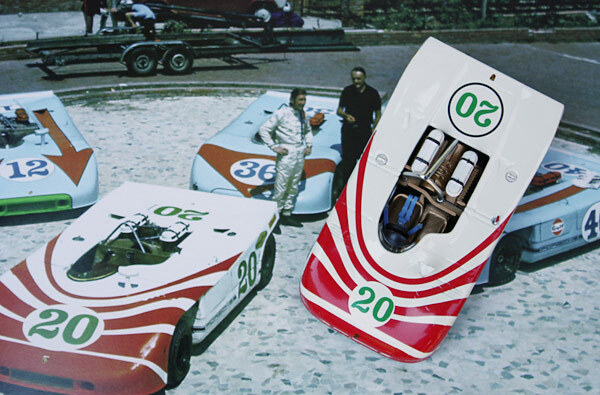 The open, compact 908/03, which was developed especially for twisting tracks such as that of Targa Florio, had a particularly aggressive appearance. 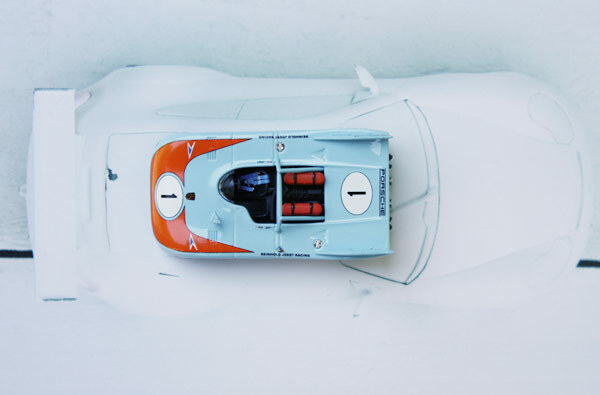 Immersed in the colors light blue and orange of the oil corporation and sponsor "Gulf" it was emblazoned with enormous arrows or triangles, which made dynamism and forward thrust appear within easy grasp, even when the cars were standing still. 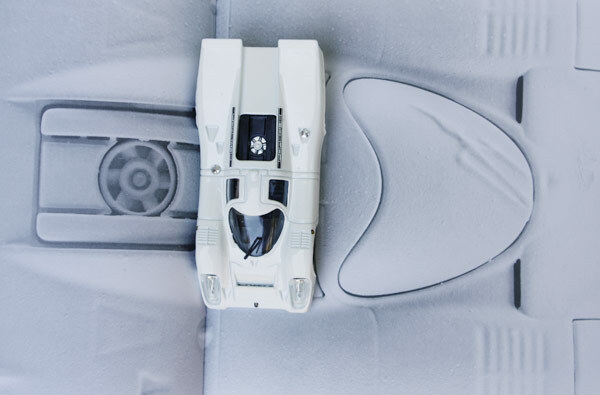 A white version has a sequence of curving red lines of varying thickness on its front, as if the air resistance itself were visualized against which the car had to race. Naturally, many designs have to do with the colors and patterns of the respective major sponsors and their corporate design. But whether it was Marlboro, Martini or Jägermeister, Gulf, Benetton, Gitanes or John Player, the appearance of the brand was always adapted to the racing car until finally advertising became branding. 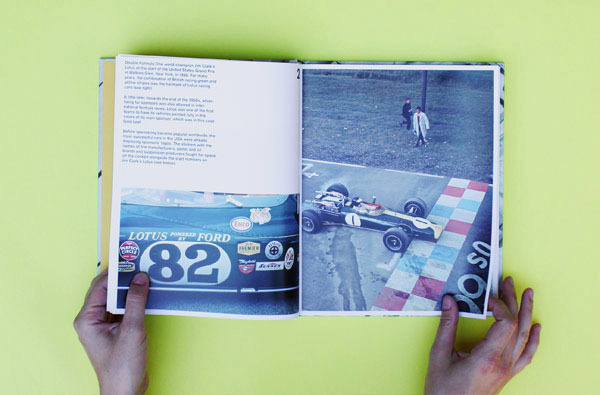 Consequently, attentive readers of "Go faster" find out not only about unusual racing cars but also about the power of excellent graphic designs. And it is somewhat easier to understand why there are so many visually vamped up normal vehicles on the streets and TV shows like "pimp my ride" have long since become popular here. Given the generally increased need to show, together with a feeling of self-esteem determined by how others perceive us, the do-it-yourselfers, tuners and pimpers were quickly infected by the visually generated feeling of being fast. 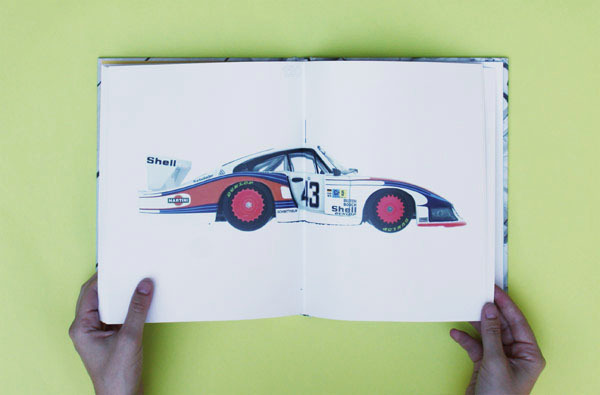 Sven Voelker's book is neither an academic manual for successful graphic design in motorsport nor is it a lexicon of successful racing cars. But this makes it even more of a more feast for all those eyes fast enough to be able to follow the visual raciness of a racing car even when it is in a display case. Sven Voelker, Go Faster. 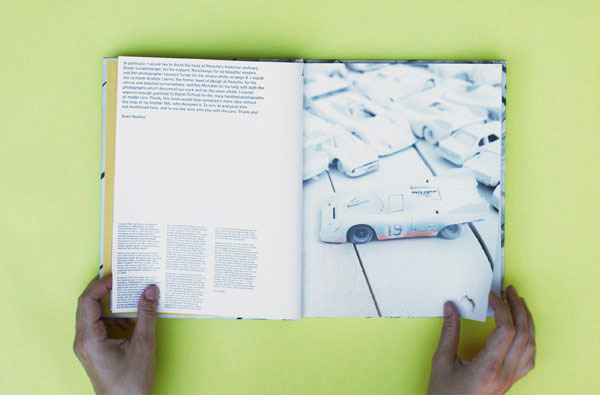 The Graphic Design of Racing Cars, Gestalten Verlag, 144 pages, hardcover, EUR 25.